The Infinite Monkey Cage is a hugely successful, award winning science discussion show from the BBC. It combines hard facts, softer theories and bold deviations into comedy. Now in it’s 12th series, it has asked: what is death, what happened before the big bang, is philosophy dead, and are pandas overrated? The show has covered everything from the search for extraterrestrial life to the large hadron collider with many of the most prestigious science communicators in the world, from Richard Dawkins to Brian Greene. It takes science seriously, but isn’t afraid to make jokes about it too. 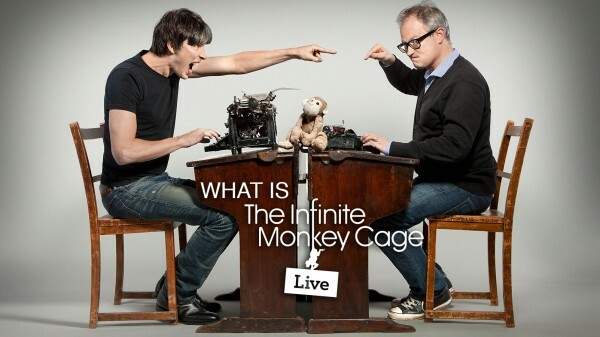 Presented by Professor Brian Cox, whose TV series on The Wonders of the Universe have been sold across the world, and Robin Ince, a former co-conspirator of Ricky Gervais and multi award winning comedian, it is one of the most listened to podcasts in the UK, a frequent number one in the iTunes chart. It has also toured as a live show mixing stand up, lectures and panel discussions, selling out eight nights at the 3500 seater Hammersmith Apollo in London. The show's aim is to make everyone in the audience wish they were a scientist, to infect them with the awe of being a living creature in vast universe that can ask questions about the stars and interrogate the world. Playful, passionate, sometimes even a little facetious, it is never afraid to take on charlatans, pseudoscientists and politicians and enjoys the angry letters it receives from homeopaths, climate change deniers, and creationists. Amongst its regular non-scientists guests have been Python legend Eric Idle, Tony award winning Stephen Fry, Star Trek and Broadway legend Patrick Stewart, and Comic book giant Alan Moore, author of Watchmen, the only comic to be in Time magazine’s Top 100 books of the 20th century. Inspired by Carl Sagan, the show truly believes that science really is a candle in the dark.